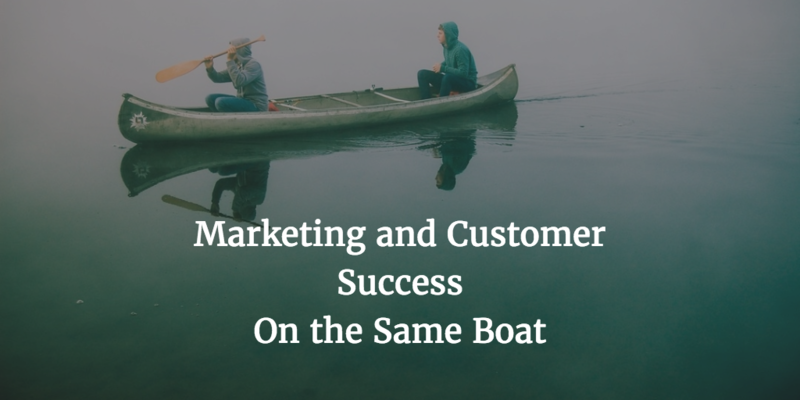 Marketing and Customer Success are like two people in a canoe. Ideally, you’re both trying to get to the same place (a successful business with happy customers). The trip is much easier when you work together well. And in choppy waters, you need to communicate or you’ll end up off course or capsized. Many businesses are building teams dedicated to the “customer success” function. Searching for Customer Success jobs on Glassdoor today delivers hundreds of thousands of results. If you’re in marketing, take a break from making infographics and plotting lead generation campaigns to search out people in the Customer Success role. They may be your new best friends. A successful customer is worth a hundred mediocre leads or a thousand “Likes” on social media. Successful customers give your business social proof – creating credibility that originates outside of the marketing organization. They refer friends and colleagues to your business, doing your lead generation and lead nurturing work for you. Have a new product or feature? Successful customers are a ready-made market for your next new thing. By engaging with successful customers, you can learn more about the market needs and concerns, ultimately creating more effective messages and products. And if your business uses a subscription model, your current customers account for a large and growing percentage of revenues. It only makes sense to invest marketing efforts with existing customers. Guess who’s engaging with those customers: customer success teams. The issues that trip people up. The benefits of collaboration flow both ways. Marketing messages set the expectations for the customer experience. Customer success teams that collaborate with marketing can make their own jobs easier by making sure new customers set off on the right path. Marketing is how you do customer success at scale. Audit the new customer experience together: Marketing and Customer Success teams can sit down together and walk through the new customer onboarding process. Exactly what does the customer see when signing up, or when they first use the service or buy the product? Does the experience match the implicit marketing promise? Look for any mismatches between expectations and experience and find ways to address them. Create a launch campaign: Work together to identify and plot the first steps of successful customers, then create a customer launch campaign to support those steps. The launch plan might be a simple series of drip emails or a game with clear objectives. Answer common questions: Customer Success teams should share frequent customer issues and questions with marketing teams and look for ways to solve them. If issues cannot be fixed in the product, marketing teams can develop videos or other materials to help the customers get started. For more ideas about integrating marketing and customer success, see the second edition of Subscription Marketing. If you’re interested in this topic, sign up below for my monthly newsletter exploring the subject of marketing for businesses with recurring customers.